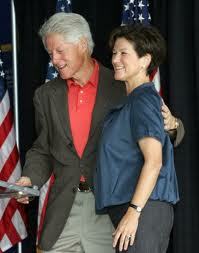 Here former President Bill Clinton accompanies Florida Democratic Gubernatorial Candidate, Alex Sink. Note his hand on her upper back (a variation of this is the hand-on-shoulder). This gesture is often seen in a similar context as it would be between a parent and child - going though doorways, at introductions, when some kind of support or leadership is expected, etc - but unlike the parent-child relationship, the underlying emotions which drive this behavior are often not motivated by support and nurturing, rather they are driven by ego. This is an extremely common gesture for Presidents and former Presidents (of both political parties), CEO's, senators, congressmen, etc. and really for those who are senior in any company or organization. It is always done by the higher ranking person to those more junior and never the other way around. Although those on the receiving end of this gesture almost never show it, this particular body language display of dominance-support can be interpreted as patronizing and condescending. It's as if the more senior person feels the physical need to remind the subordinate (or themselves') who's in charge. It can be thought of as variation on the manipulator-adaptor-pacifier (MAP) that is performed on another person, and while it may cause the receiver anxiety, it pacifies the giver. Everyone who has ever been on the receiving end of this gesture knows the awkwardness and uncomfortable feeling this gesture generates. For those of you in power, know that while you may not realize it, this only serves to alienate you from those in whom you are trying to engender trust and devotion.